May 12, 2014 in spotlight // The Most Fabulous Wedding Dresses Ever! 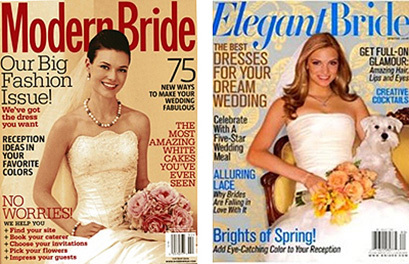 Conde Nast closes Modern Bride and Elegant Brides magazines as of November 2009. They have consolidated their bride publications and have made their Brides magazine a monthly magazine instead of every two months. Moden Bride has been a well-loved resource for wedding dresses, wedding planning, and honeymoon planning for decades. It will be missed. © Copyright 2006-2014, Victoriana Magazine. All Rights Reserved.